A new ambassador of the Czech Republic has been accredited to Dominica. Ambassador Vladimir Eisenbruk of the Czech Republic resented his letter of credence to President His Excellency Charles Savarin at the State House on Friday 16th, November 2018. 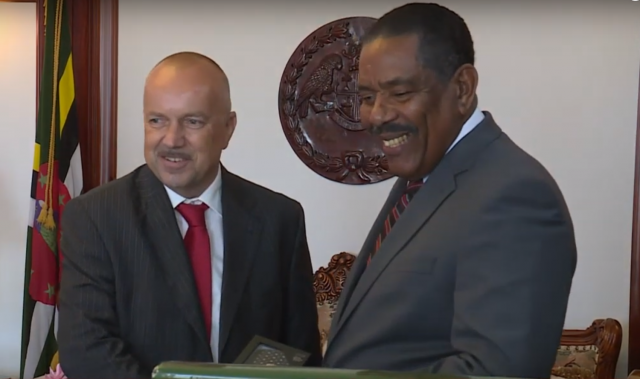 During the ceremony, Ambassador Eisenbruk stated that he hopes with his appointment comes improved relations between the two countries adding that despite the geographical distance between the Czech Republic and Dominica, “we can cooperate on many levels”. This he said referring to the exchange of individuals, knowledge and technology. With the world now considered a global village he said his country will be more than willing to assist Dominica when it comes to natural disasters. The Czech Republic he continued to ready to help bilaterally or through European Union mechanism. Meanwhile, President of Dominica His Excellency Charles Savarin said this new relationship bodies well for a brighter future for the two countries noting the country’s commitment through its new Ambassador to strengthen relations and his intention to establish an Honorary Consulate here in Dominica. President Savarin described the relationship between the two countries as “cordial” since the formalizing of ties in 1996.